If you are always active in online communities, you have faced with what internet users call “trolling”. The act of trolling, or being trolled, is what we have to deal with while using the web. Here’s a short description of what the trolling is for the users, who have not the slightest idea of what is going. According to the Urban Dictionary, trolling is about “being a prick on the web just because you can. As a rule, unleashing several sarcastic or cynical remarks on an innocent by-stander, because it is the internet and… just because you can”. It’s a good idea to compare internet trolls to the ones known in Scandinavian folklore. According to the old myths, troll is an ugly and dirty creature that usually lives in the darkest places and catches anything that passes away to get a quick meal. Without a doubt, the mythological creature is similar to the ones that live on the internet nowadays. Internet trolls hide behind the laptop screen and make sure to pointlessly cause conflicts within online community. Where do they worst internet trolls live? First of all, take a look at the YouTube community. If you’re looking for the worst comments in the social web, make sure to watch some of the most popular videos in YouTube. It’s a typical rule for this source – the more comments and views the video has, the more trolling you will find. The second position in our trolling hit parade belongs to the blog comments. If any news or blog web site provides its users with an opportunity to leave comments, there are tons of trolls causing troubles in any way possible. This is typical for the blogs that include information of a controversial nature. Then go the forums. Forum is a place, where internet users can discuss various topics with the other individuals, who share their viewpoints. However, once in a while, a couple of trolls may pop up and turn this or that conversation into a huge pointless argument. Any social networking web site like Instagram, Facebook, Tumblr or Twitter, is like heaven on earth for the internet trolls. Now almost anyone can leave comments under the status update, send a bunch of stupid anonymous questions, reply to the tweets, trolling anyone and anywhere they can. Celebs on Twitter, famous world brands on Facebook with lots of followers suffer from trolling day by day. Unfortunately, as the internet community gets more and more social, trolling will go on spreading wherever it’s possible. 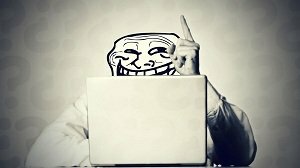 So, why do online users troll on the web? There are different reasons behind such a dirty online activity. While some of them may be attention-starved, the others feel a kind of depression, jealousy, sadness, anger or some other emotions. That is why they consider trolling a great opportunity to express all that much that has been fermenting in their hearts, and it can be done absolutely anonymously. They can hind behind the laptop screen and then go on with their real lives without the necessity to deal with any sort of consequences. If there’s a troll trying to spoil your internet experience, just make sure to ignore him. Your emotional balance and precious time are more important than pointless efforts of complete stranger on the web to insult you.